Meadow is at the forefront of technology and is a leader in the manufacture of animal feeds. Investments in the latest equipment, computer hardware and software have always been a focus at Meadow in order to remain technologically proficient and ahead of the pack. “More than just feed”, the slogan which every Meadow employee strives to deliver, epitomizes the special relationship Meadow’s Technical Advisors have with our customers and we share our customer’s core focus of finding innovative ways to reduce costs or increase production output. 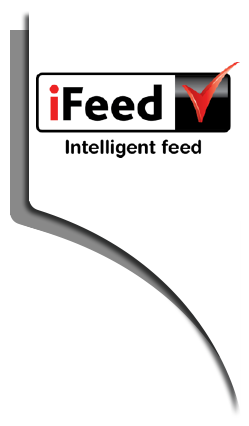 To support this philosophy, Meadow Feeds has embarked on a fresh drive to deliver an even better service with the introduction of iFeed. Intelligent, which the “i” refers to, encapsulates Meadow’s initiatives and was designed to offer a more intelligent level of service to our customers through the use of technological advancements yet to be used in the animal feed industry. The Meadow Technical Advisor now offers even more with the new Apple iPad application which is designed specifically for each farm species and supports our vision that each technical advisor should always have the necessary tools available to assist farmers to make informed decisions about their business activities, during each farm visit. Each species now has their product profiles downloaded onto the iPad which can be easily emailed or printed and the iPad applications are specifically designed to enable the various spreadsheets to be easily populated with the current on-farm parameters and then to quickly calculate the various performance and cost benefit scenarios, without the need to step into an office. The more time our technical advisors are on farm, the more value we believe they are adding to customer’s business. Meadow’s Technical Advisors are also equipped with an assortment of sampling tools and meters which can measure temperature, ammonia, pH, airflow and CO2 levels. During the Large Herds Dairy Conference held in Durban this year, Meadow Feeds invited dairy producers to the Meadow Feeds show stand to witness the launch of the iFeed concept within the ‘Meadow Dairy App’, which is the first of its kind in Africa. Consultants from Australia and New Zealand were intrigued and commended Meadow Feeds on the innovative steps taken to keep abreast of technology with the application of a concept that they had not previously seen within the animal feed industry. This was followed by launch of The Pig App at the South African Pork Producers Conference in September 2013 where producers were given the opportunity to run simulations during the conference based on their individual on-farm parameters. Poultry applications are currently being developed which will also help producers make on the spot decisions. In line with the iFeed concept and the introduction of new technology, Meadow has also embarked on an ambitious project to monitor our customer’s bulk feed bins. This initiative will deliver a new standard of service levels to those customers participating in this exciting new development in that they will never need to pick up a phone to place a feed order again. As already commissioned on a number of farms in the Eastern Cape, Western Cape and Gauteng, the bulk feed bins have had load cells and transmitters installed, which communicate wirelessly with the local Meadow offices at all times. This not only ensures that farmers never run out of feed but also optimizes delivery efficiencies and ultimately reduces costs. This initiative also offers other advantages which includes; measuring feed intakes per day, live FCR’s, stock management and the easy detection of feed theft. The software also displays proof of delivery therefore creating the possibility of nighttime deliveries in the future. We believe that by continually investing in technology, we can better serve our customers who demand innovative solutions to complex problems. Facing these challenges head-on demonstrates our commitment to leading today’s farmers into tomorrow. Meadow Feeds aims to remain the leader in animal feed technology and will continue to seek ways to add new services to the iFeed brand. With Bin Monitoring the feed in the silos on the farm is measured in a live system that can be accessed via the internet from anywhere in the world. This offers the capability to the customer to reconcile the feed offered to the animals during each feeding period and validate the calibration of the feeding system. It also offers a control mechanism to limit theft as the feed in the silos are continuously being recorded and stored in a database that will reveal the exact time and amount of the actual variance in question. To Meadow this offers the opportunity to improve truck utilisation and reduce delivery cost to the customer. Meadow specie specific apps have been developed to expand the on-farm service from a predominantly technical nutritional focus to include financial parameters. Ultimately, everything we do is centred around the single purpose to improve the profit position of all stake holders. These apps are snapshots of the current financial position of the customer, given a specific set of conditions and will illustrate the impact of any changes to these conditions on the net profit of the customer. Every Technical Advisor has been issued with a new toolbox that contains the equipment required to effectively perform on-farm duties. The equipment is safely stored in predesigned storage spaces inside the toolbox to ensure it does not move about and get damaged during travelling. The whole toolbox can be placed in the boot of a car to ensure that every piece of equipment is always close at hand. A Professional Development Program was developed whereby every sales and/or technical person is required to perform a bi-annual evaluation to ensure compliance to Meadow standards and the continuous drive for excellence. The PDP contributes to ensure the Meadow sales and technical people stay informed of new developments and are equipped to handle unexpected challenges.